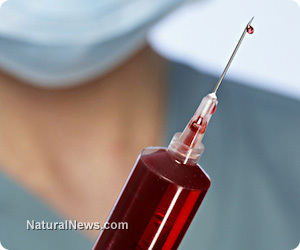 (NaturalNews) A shocking new report reveals that receiving blood donated from someone vaccinated with Gardasil, the Human Papilloma Virus (HPV) vaccine, may be downright dangerous to your health. S.A.N.E. Vax, Inc., contracted with an independent lab which tested 13 Gardasil vials from 13 different lots from all over the world and found that the genetically modified HPV DNA strands present in Gardasil had firmly attached to the vaccination's aluminum adjuvant in a whopping 100% of the samples tested. While natural HPV DNA does not stay in the bloodstream long, the aluminum binding allows the genetically modified recombinant HPV DNA (rDNA) to behave differently, potentially entering cells and wreaking havoc. The vials were analyzed after a concerned parent contacted S.A.N.E. Vax, because her 13-year-old daughter developed an auto-immune reaction that would later be diagnosed as acute juvenile rheumatoid arthritis within 24 hours after receiving her third Gardasil vaccine. Two years following the incident, the girl's blood still tested positive for HPV DNA that should not be there. In fact, these strands have also been found in post-mortem samples as well, as in the case of teen Jasmine Renata, who died inexplicably in her sleep six months after receiving a Gardasil shot. S.A.N.E. Vax points out that both Merck, the pharmaceutical company that manufactures Gardasil, and the U.S. Food and Drug Administration (FDA) claimed there was no viral DNA in Gardasil at the time of its "fast-tracked" approval. Milford Hospital Pathologist Dr. Sin Hang Lee, who analyzed the Gardasil vials, testified, "Undegraded viral and plasmid DNA fragments are known to activate macrophages, causing them to release tumor necrosis factor, a myocardial depressant which can induce lethal shock in animals and humans." NaturalNews has previously reported that, by injecting a vaccine, any potentially toxic ingredients therein become much more harmful, because they are allowed to bypass the natural protections of the respiratory system and digestive tract. Dr. Lee noted, "DNA in an injectable protein-based vaccine may increase the risk of autoimmune disorders and gene mutation which may lead to malignancies." Both Merck and the FDA should have been aware of this risk, but in fact, according to the official prescribing information for Gardasil, the vaccine "has not been evaluated for the potential to cause carcinogenicity or genotoxicity." Anyone who receives the Gardasil shot or allows administration to their children is taking a huge auto-immune disorder and/or cancer risk. Vactruth's Sandy Lunoe wrote the Centers for Disease Control and Prevention (CDC) to ask about the potential dangers of blood transfusion recipients taking a Gardasil shot; the CDC responded that "the presence of DNA fragments is expected" and "Vaccination with Gardasil provides no known risk to the blood recipients or the blood donor." Lunoe notes that the CDC gave no evidence to support this statement. Tom Fitton, president of watchdog Judicial Watch, wrote, "The FDA adverse event reports on the HPV vaccine read like a catalog of horrors." Some of the adverse events include not only auto-immune disorders and cancer, but Guillain-Barre syndrome, paralysis, numbness, facial palsy, chronic pain, infertility, chronic fatigue syndrome and more. So many horrible reactions have occurred in the wake of Gardasil vaccinations that the Japanese government has withdrawn support and now requires the nation's medical professionals to warn patients who request Gardasil about the potential for adverse effects. As of August 2013, S.A.N.E. Vax reports that HPV vaccines have caused over 30,000 adverse reactions, including 6,154 cases where the recipient did not recover, 975 cases where the recipient was disabled and 139 deaths. The National Vaccine Injury Compensation Program has already awarded nearly $6 million in damages to Gardasil victims. Despite the mounting evidence that Gardasil is dangerous, the FDA continues to maintain that Gardasil is safe and effective, and the National Institutes of Health even recently awarded the University of California nearly $550,000 to study new propaganda campaigns for pushing the shot on low-income minority parents. This is also despite the fact that HPV itself does not cause cervical cancer. In addition, the CDC even admits that 90% of HPV is taken care of naturally by the body's immune system within two years. Key Gardasil developer Dr. Diane Harper has recently come out against the vaccine to clear her conscience, stating, "Gardasil has been associated with at least as many serious adverse events as there are deaths from cervical cancer developing each year." In other words, thousands have been damaged by a vaccine that does not even provide any real health benefit.